Where is God when I am suffering? Where is God? How do you know that you have found God’s favor? How do you know that God cares about you? It is easy and natural to believe that God’s favor and grace is evident if you are healthy and wealthy and strong and thin. It is easy and natural to believe that God’s favor is evidenced in the things of this world; money, cars, houses, stuff. We like this idea; it makes sense. How many times have you heard people say, “God wants me to be happy.” So many churches present this as their message that if you are faithful, God will bless you with health and wealth, and if you are not experiencing health and wealth you must be doing something wrong. We like this idea and it makes good sense to us, but then we come to our Old Testament reading from Lamentations. We don’t hear much from Lamentations in our three year lectionary. In fact this is the only reading we get in three years. 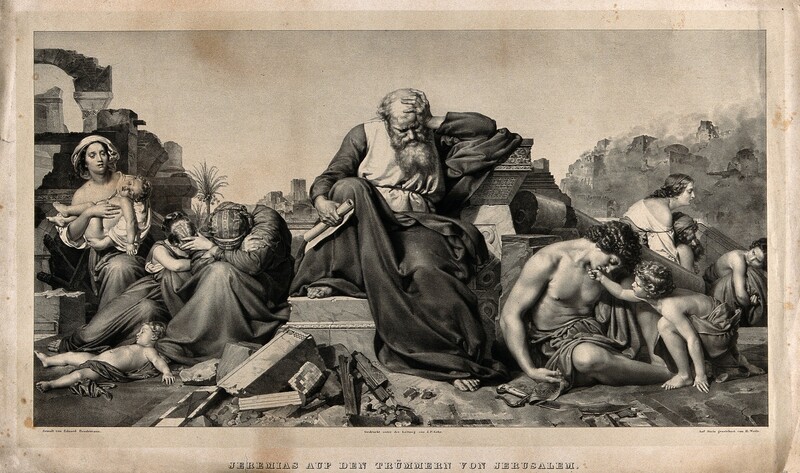 Lamentations is written by the prophet Jeremiah in 586 B.C. right after the Babylonians brutally conquered Jerusalem and Judea. They had just finished heartlessly killing many and taking more into exile and leaving Jerusalem in utter ruins. Things have gone terribly for the children of Israel. The great temple built by Solomon where God dwells with His people has been destroyed; the walls protecting the city have been torn down. Dead bodies lay in the streets. The people are starving; the children cry out with empty bellies. Those remaining wander through the ruins mourning the dead and aching for those taken away into exile not knowing what will happen to them. The glorious Holy City lies in utter ruin. Where is God in all this? Has God abandoned the people of Israel? Is all hope gone? Where is God in times of trouble? Where is God in times of suffering and hardship? In times of great trouble we want to believe that God has abandoned us. We are offended when we suffer as if it is something strange. Where is God when you are hurting? Where is God in times of trouble? We find the answer in this somewhat neglected book of the Bible; Lamentations. Jeannette and I were married in May of 1988 and in June of that year my mom found out that her cancer was back; this time in her liver and bones. She did fairly well for about a year but then in October of 1989 she was hospitalized and grew increasingly weak. The gravity of the situation became clear when the hospital staff asked the family to make decisions about resuscitation and life support. Mom’s parents flew in from Chicago on October 28 and went straight to the hospital without even waiting for their luggage. Mom rallied her strength to talk with her mom and dad and then a few hours later my mother died with her mother, Jeannette and me at her side. It was devastatingly hard to be there and to go through that with my mother. The grief was intense and it still sneaks up on me. Where was God? Where was God during this terrible time? Lamentations 3:22-23 (ESV) 22 The steadfast love of the Lord never ceases; his mercies never come to an end; 23 they are new every morning; great is your faithfulness. The steadfast love of the Lord never ceases. In your times of suffering the steadfast love of the Lord never stops. In your times of trouble the Lord’s unwavering love is still with you. His mercies never come to an end. In the dark fog of distress and anguish the mercy of God never ends. In sickness, death, divorce, prison, conflict, hunger, poverty, God’s mercies never end. As the sun rises in the morning so do God’s mercies renew for another day. Great is God’s faithfulness. When you are hurting it is hard to see that God is there with you. Agony and sadness obscure God, but through the window of dim faith you look through the dark fog of suffering and see God’s presence with you. Suffering is not an offense to life as a Christian; suffering is part of life as a Christian. Times of suffering and trouble are part of life under the cross of Christ and you are called to accept these times with patience and endurance. Lamentations 3:25-26 (ESV) 25 The Lord is good to those who wait for him, to the soul who seeks him. 26 It is good that one should wait quietly for the salvation of the Lord. The baptismal promise of God is not a call to a life of health and wealth and glory. It is not a call to live your best life now or become a better you. It is not a call to dream big dreams and cast big visions. It is a call to wait quietly for the salvation of the Lord. This is hard. This is not what we want to hear. We want to hear that life in Christ will be easy. You want to hear that life in Christ will be simple. But easy, simple lives do not bring strength and endurance. It is an awful truth but it is truth. Suffering and trouble can be beneficial. This is not just some strange Old Testament teaching. St. Paul writes about this to the church in Rome. Romans 5:3-5 (ESV) 3 More than that, we rejoice in our sufferings, knowing that suffering produces endurance, 4 and endurance produces character, and character produces hope, 5 and hope does not put us to shame, because God’s love has been poured into our hearts through the Holy Spirit who has been given to us. The death of my mother was very hard and it changed me; it put me on a different path in life. Likely it put me on the path to be here with you. God used that terrible event to make me a better servant. Lamentations 3:27-30 (ESV) 27 It is good for a man that he bear the yoke in his youth. 28 Let him sit alone in silence when it is laid on him; 29 let him put his mouth in the dust— there may yet be hope; 30 let him give his cheek to the one who strikes, and let him be filled with insults. The Lord allows trouble to come. The Lord uses trouble and suffering and hardship to help us learn to trust in Him and quietly endure. St. Paul learned this hard lesson and writes about it 2 Corinthians 12:7-9 (ESV) 7 So to keep me from being too elated by the surpassing greatness of the revelations, a thorn was given me in the flesh, a messenger of Satan to harass me, to keep me from being too elated. 8 Three times I pleaded with the Lord about this, that it should leave me. 9 But he said to me, “My grace is sufficient for you, for my power is made perfect in weakness.” Therefore I will boast all the more gladly of my weaknesses, so that the power of Christ may rest upon me. Lamentations brings us a very hard lesson and a very good lesson. There will be times of trouble. There will be periods of suffering. But God will not leave you; He is there with you in your suffering. He walks with you in your trouble. He teaches you to trust Him alone. In 586 B.C. Jerusalem is devastated by the Babylonians and yet there is hope for the future and in 70 years Jerusalem is restored by the Persians. In your times of trouble God does not leave you or forsake you. Jesus came to earth to take on human flesh and take the sins of the world into Himself and take those sins to the cross there in Jerusalem. Jesus, the new temple, is destroyed and raised again in three days. Jesus conquers sin and death forever. That same Jesus comes to you in His word and with His Body and Blood to renew His mercies and promises; to pour out upon you forgiveness, life and salvation. Lamentations 3:22-23 (ESV) 22 The steadfast love of the Lord never ceases; his mercies never come to an end; 23 they are new every morning; great is your faithfulness.